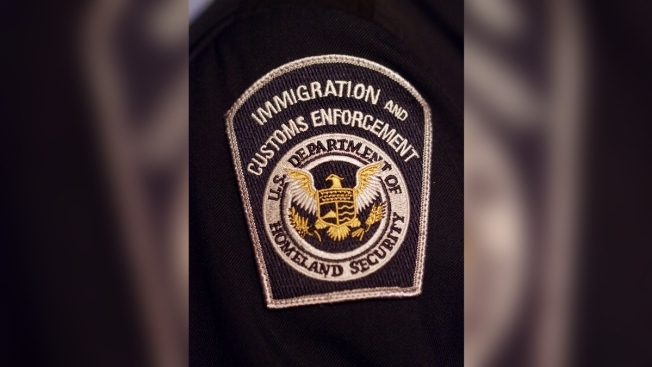 In this March 5, 2014, file photo, an Immigration and Customs Enforcement (ICE) badge on a uniform is shown in Washington, DC. Court documents say a Portland, Oregon, man pleaded guilty to trying to bribe an immigration official to deport his wife and her child from a previous relationship, NBC News reported. Antonio Oswaldo Burgos, 48, agreed last month to plead guilty to one of three counts of bribery of a public official in exchange for a reduced sentence, according to federal grand jury documents that were unsealed after his plea hearing in Portland on Tuesday. Burgos married the woman, who wasn't identified, in El Salvador, according to the plea deal. But after he brought the woman and her minor child to the United States, the "marital relationship deteriorated," and the woman moved out with her child. He tailed a deportation officer from Immigration and Customs Enforcement, or ICE, in his car for almost 15 miles from the ICE office in Portland across the state line to the southern Washington city of Vancouver on May 24, the plea deal said, before offering the officer $4,000 to deport his wife.